How to Track Rakeback in PT4? What are the different rake methods and how do they work? PT3 threadnaught explaining why calculating rakeback is non trivial. VIP Grinders – Rake Structures Explained. If it’s weighted, which is most common, you cannot calculate it accurately, deal with it. If it’s dealt, you’re in luck and can calculate it accurately. 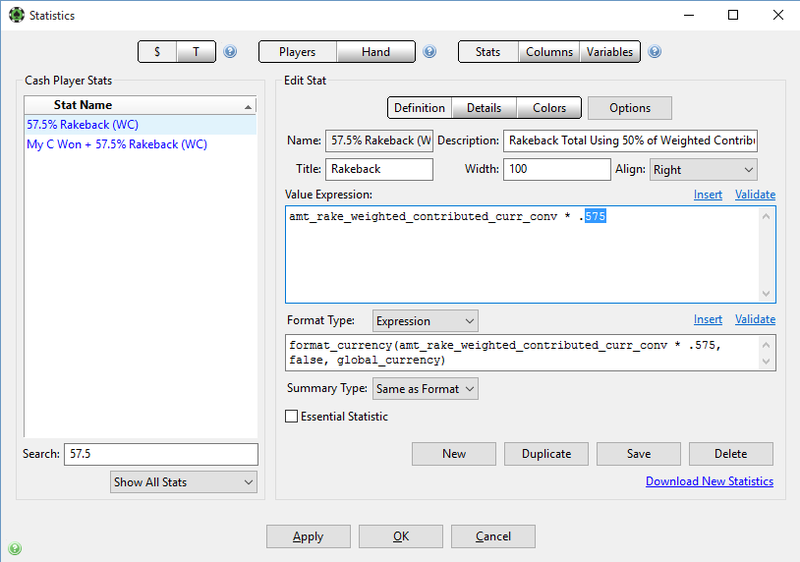 Unzip the files, there should be 2 stats in each, one is just rakeback and the other is C-won with rakeback. So 4/5 of all the sites above use some form of contributed weighted method of rakeback and they alone can calculate it. We can tweak the WC stat to reflect our rakeback and have some idea of what it looks like. Duplicate the stat, change it’s name from “Rakeback Stats Using 50% MGR” to whatever your Blackchip rb % is so if it’s 30 then name it “Blackchip Rakeback Stats Using 30% MGR“. Then edit the value in the statistic definition in PT4 in both “Value Expression” and “Format Type” for both the WC stats. Change it from .575 to .400 for 40%. 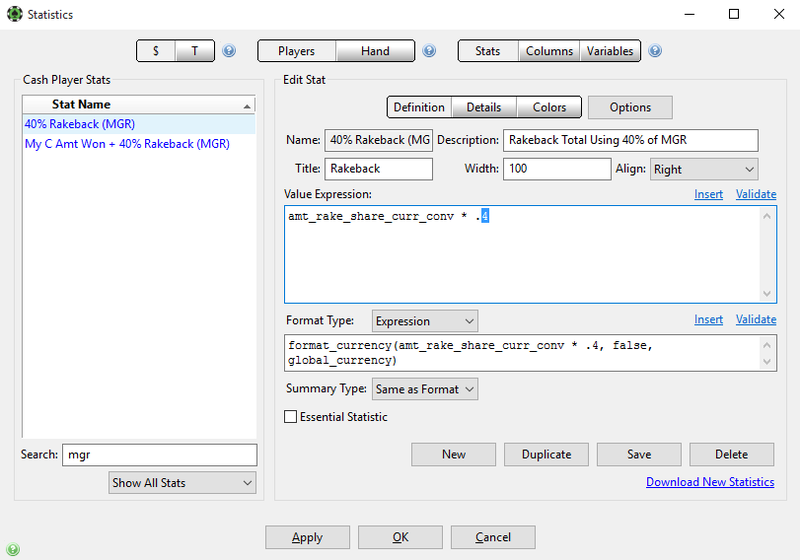 For PokerKing however, we can use the MGR stat as its the same as ‘dealt’ and calculate rakeback accurately by modifying the MGR stat we downloaded. Duplicate the stat and rename it so you know the site and rb % in the name itself. Then edit the value in the statistic definition in PT4 in both “Value Expression” and “Format Type” for both the MGR stats. Change it from .4 to .45 to set rb% to 45%. Remember you can duplicate each stat and customize it to reflect your rakeback. WC is an approximation at best and MGR should be spot on if you put in your rakeback % correctly. Check the “Overlay Stats” checkbox and “Configure” as in choose the stat you want from the custom stats we just created. 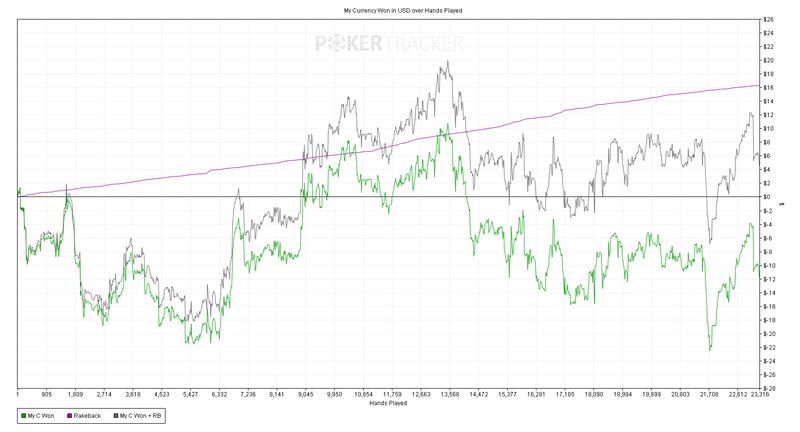 You should now see a Rakeback or C-won with rb line on your graph.